Wizard Dodgeball plays very similar to the traditional game (a game I’d never heard of until the Vince Vaughan movie came out) but you play a field of spell flinging wizards. Your aim is to grab the balls from the centre of the board and throw them at your opponents’ wizards. If you hit them they’re eliminated from the game but if they manage to catch the ball you’re eliminated. Each wizard has different levels of abilities; such as throwing, catching, and casting spells, and it’s the spells that make this game interesting. You can shrink your opponent, make your players faster or even turn the ball into a fireball. 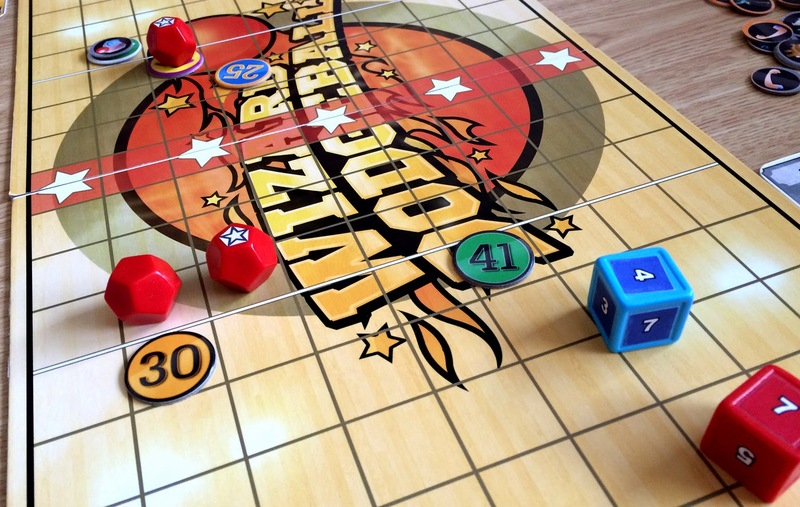 Wizard Dodgeball is probably the best interpretation of dodgeball into a board game format; I just can’t see how you could improve upon it and it’s based on a simple and intuitive dice off. When throwing a ball or casting a spell you roll the coloured dice based upon your wizard’s skill, your opponent then throws with their opposing skill and highest value wins. It gets really interesting when a double is rolled. A double while attempting to dodge the ball means the target has caught the ball and the thrower is eliminated from the game. A double while resisting a spell causes it to rebound and effect the caster, which leads to much hilarity when a wizard freezes or shrinks himself. Apart from some bonus or penalties depending on range Wizard Dodgeball really is that simple. It’s a game that’s easy to grasp and get into playing really quickly. There is a more complex element, and a way in which you can exercise your strategy muscles, is in the way you build your team and their compliment of spells. Again it’s relatively simple to set up; your team of wizards has magic points that can be spent on spells and it balances so the better players are the worst spell casters. But there’s not enough meat on Wizard’s Dodgeball for me, it’s just too light of a game. Although there is strategy, mainly in your choice of how and when to use spells, the strategy is never really deep enough for me to be engaged. It didn’t help that a few of the spells and combinations quickly lead to certain strategies. A fireball spell ignores range so it’s obvious to use it on a wizard at the back of the pitch. Freezing the opponent’s most athletic player can take them out of action for a couple of turns and makes them easy to hit and heaven help them if they’ve forgotten to bring a dispel spell to the table. A relatively experienced gamer is going to pick up these strategies quickly, so quick that every game I’ve played has been over in a flash. The short playtime could also be down to the wizard elimination. If you take a couple of wizards on the opposing team out, either by elimination or a freeze spell, the game quickly resolves to its inevitable conclusion. In a way I think the spells actually harm the game in this way as rather than balancing the game they can tip the balance quicker. All these combined make me believe that Wizards’ Dodgeball isn’t for me for the simple reason that I’m too old. Seasoned gamers will quickly work out how to use the spells and how best to combine them, so much so I think the game is going to be much better received with younger players. It’s easy and quick to play, has a quirky and silly theme and cartoony artwork. This isn’t a game for strategy gamers; it’s a game to introduce strategy to new gamers. However since I don’t have any sprogs of my own, and going out and rounding up kids is generally frowned upon, I haven’t had the chance to test out this theory. 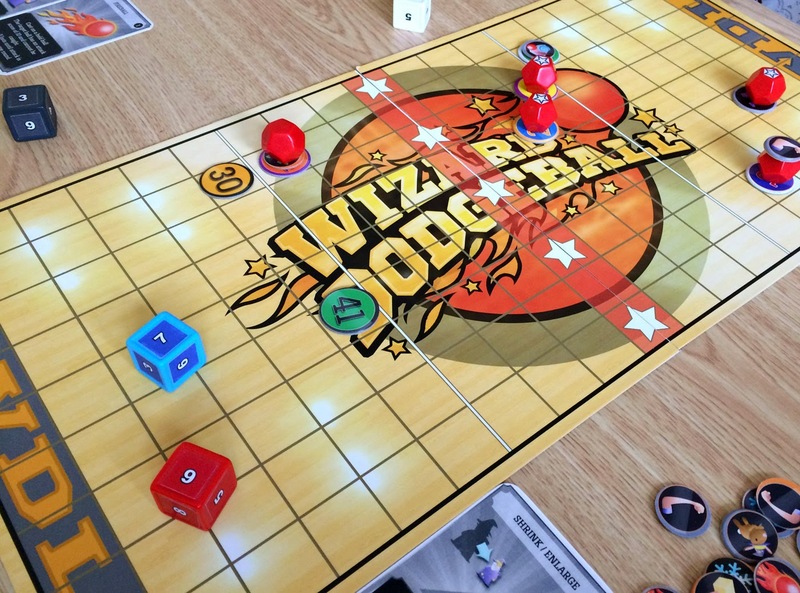 Wizard Dodgeball is on Kickstarter now.